Since before the United States of America was a country, the Marine Corps has provided patriotic young men and, since 1918, women with the chance to fight for, and protect, our freedom, instilling them with the core values of honor, courage, and commitment along the way. By refusing to be anything or accept anyone other than the best, the United States Marine Corps has established itself as America's elite fighting force. Over the course of nearly two and a half centuries, the Marine Corps has become world-renowned for the bravery, determination, and selflessness displayed by those who have proudly called themselves "Marine" in some of the most infamous battles in our country's history. From Belleau Wood to Guadalcanal, from Iwo Jima to the Chosin Reservoir, from Khe Sanh and Hue City to Fallujah, the Marine Corps has shown time and again that it doesn't matter who the enemy is, how brutal the fighting is, or how slim the odds are--Marines persevere to get the job done, paying for it in blood, sweat, and tears. Today, November 10, marks the 243rd birthday of the Marine Corps and tomorrow, November 11, is Veterans' Day. Generations of heroic men and women have sacrificed their time, their energy, their comfort, and, in many cases, their lives to protect the freedom we as Americans value so dearly. 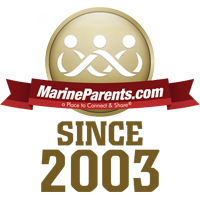 With that in mind, we at Marine Parents would like to extend a heartfelt "Thank You" to our men and women in uniform, past, present, and future. Happy Birthday Marines! Click here to learn more about the Marine Corps Birthday. Gen. Robert Neller reminds us how the Corps' legacy lives on in every Marine. 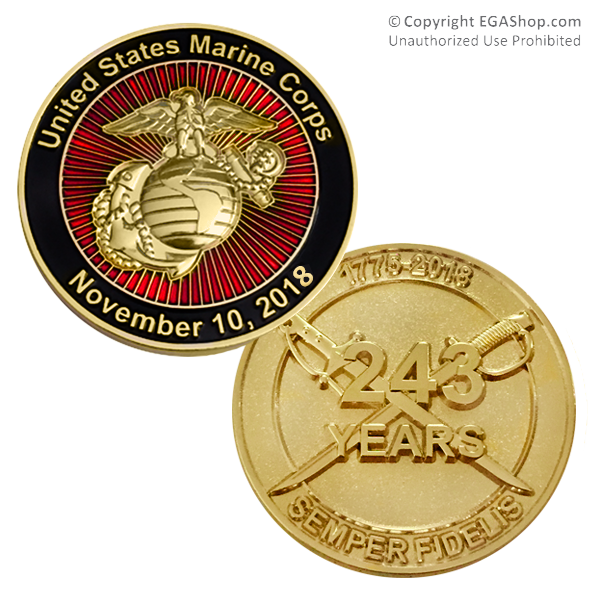 2018 Marine Birthday Coin (44mm) finished in shiny gold, celebrates 243 years of the Marine Corps. The front of the coin features The Eagle, Globe and Anchor with United States Marine Corps surrounding the vibrant red background. 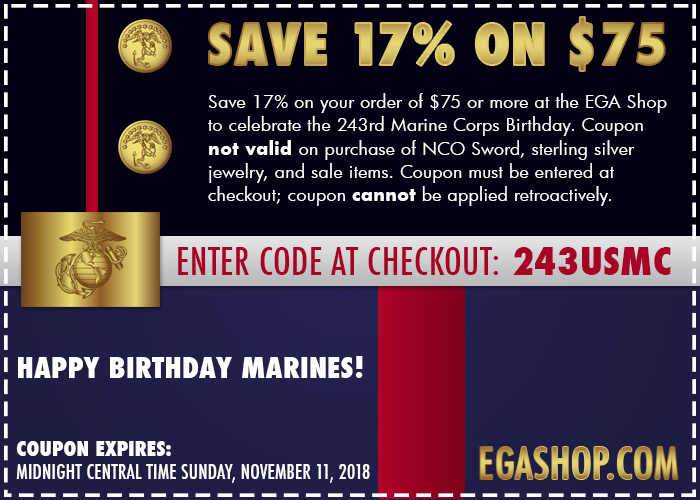 The obverse features the classic Marine Corps enlisted and officer swords, crossed, with the text 243 Years.